Born in 1882 in Nyack, a small town on the Hudson River about forty miles north of New York City, Edward Hopper was the son of a local businessman. After spending a brief period at a school for illustrators, he attended the New York School of Art from 1900 to 1906. His teachers there were William Merritt Chase, Kenneth Hayes Miller, and Robert Henri. Henri, above all, became important to Hopper, not so much in artistic as in personal terms, for Henri was a man who set high standards for himself and his students. It was also he who pointed out that everyday American life contained an inexhaustible reservoir of new and untried subject matter. Robert Henri has gone down in art history as a co-founder of The Eight, a group of artists who in spring 1908, prevented from exhibiting in the prestigious National Academy of Design, mounted their own show at the Macbeth Gallery, New York. Henri set European masters on a par with the American artists he admired, even giving them priority, and that not only in chronological terms. In the late 1880s and the middle of the 1890s, Henri had studied in Paris for extended periods, responding to the call of France like many American artists of the day, before returning home with a renewed consciousness of their American roots. To his students, Henri extolled the old and modern masters who meant so much to him: Rembrandt, Diego Velazquez, Francisco Goya, Manet, Degas, Daumier - an odd mixture, but indicative of the eye of a born realist who was interested above all in the representation of the human figure. Being a student of Robert Henri, Hopper was almost preordained to go to Paris. His initial stay lasted from October 1906 to August 1907. Unlike his teacher, Hopper did not enroll in a school or academy, but conducted his studies in museums and on the streets. He returned to Paris twice, in 1909 and 1910, for brief stays. The key accomplishment of the early period was an assimilation of Impressionism. Hopper's palette grew lighter, his brushwork freer, and his observation more precise. His approach to motifs began to show a growing independence from any model or ideal, both in the American subjects and the Paris ones. Under the Impressionist spell, Hopper discovered the unique light of Paris: "The light was different from anything I had known," he later recalled. "The shadows were luminous, more reflected light. Even under the bridges there was a certain luminosity." From Paris Hopper undertook trips to Amsterdam, London, Brussels, Berlin, Madrid, and Toledo. In the Netherlands, apart from Rembrandt, he discovered Johannes Vermeer as a painter of spiritual illumination and an incomparable master of the intimate interior. Among French painters, Hopper was impressed by Manet and Edega Degas, Camille Pissarro and Sisley, but the deepest involvement came with the work of Monet, Cezanne, and Van Gogh. Fauvism and the beginnings of Cubism, on the other hand, seem to have escaped Hopper's notice. 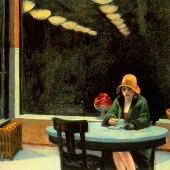 His preoccupation with the great masters, among whom the Impressionists were already beginning to figure, apparently led Hopper to overlook the contemporary avant-garde. "Whom did I meet? Nobody," he later admitted. "I'd heard of Gertrude Stein, but I don't remember having heard of Pablo Picasso at all." 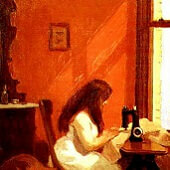 In the 1910s, Hopper struggled for recognition. He exhibited his work in a variety of group shows in New York, including the Exhibition of Independent Artists (1910) and the famous Armory Show of 1913, in which he was represented by a painting titled "Sailing". Although he worked primarily in oil painting, he also mastered the medium of etching, which brought him more immediate success in sales. He began living in the Greenwich Village neighborhood, where he would continue to maintain a studio throughout his career, and he adopted a lifelong pattern of spending the summers in New England. 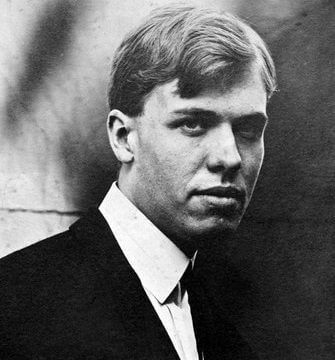 In 1920, at the age of thirty-seven, he received his first one-person exhibition. The Whitney Studio Club, recently founded by the heiress and arts patron Gertrude Vanderbilt Whitney, showed sixteen of his paintings. 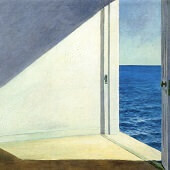 Although nothing was sold from the exhibition, it was a symbolic milestone in Hopper's career. Just a few years later, Hopper found himself in a far more prosperous and prominent position as an artist. His second one-person exhibition, at the Frank K. M. Rehn Gallery in New York, was such a commercial success that every painting was sold; the Rehn Gallery would represent him for the rest of his career. In 1930, his painting House by the Railroad was the first work to be acquired for the collections of the newly founded Museum of Modern Art. 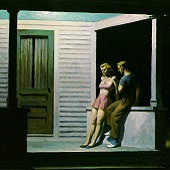 This image embodied the characteristics of Hopper's style: clearly outlined forms in strongly defined lighting, a cropped composition with an almost "cinematic" viewpoint, and a mood of eerie stillness. Meanwhile, Hopper's personal life had also advanced: in 1923, he married the artist Josephine Verstille Nivison, who had been a fellow student in Robert Henri's class. 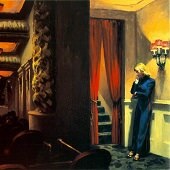 Jo, as Hopper called her, would become an indispensable element of his art. She posed for nearly all of his female figures and assisted him with arranging the props and settings of his studio sessions; she also encouraged him to work more extensively in the medium of watercolor painting, and kept meticulous records of his completed works, exhibitions, and sales. In 1933, Hopper received further critical recognition as the subject of a retrospective exhibition held at the Museum of Modern Art. He was by then celebrated for his highly identifiable mature style, in which urban settings, New England landscapes, and interiors are all pervaded by a sense of silence and estrangement. His chosen locations are often vacant of human activity, and they frequently imply the transitory nature of contemporary life. At deserted gas stations, railroad tracks, and bridges, the idea of travel is fraught with loneliness and mystery. Other scenes are inhabited only by a single pensive figure or by a pair of figures who seem not to communicate with one another. These people are rarely represented in their own homes; instead, they pass time in the temporary shelter of movie theaters, hotel rooms, or restaurants. 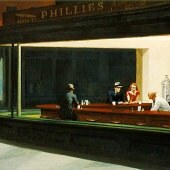 In Hopper's most iconic painting, Nighthawks, four customers and a waiter inhabit the brightly lit interior of a city diner at night. They appear lost in their own weariness and private concerns, their disconnection perhaps echoing the wartime anxiety felt by the nation as a whole. The Hoppers spent nearly every summer from 1930 through the 1950s in Cape Cod, Massachusetts, particularly in the town of Truro, where they built their own house. 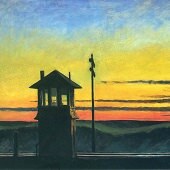 Hopper used several nearby locations as frequent, repeated subjects in his art. He also began to travel farther for new imagery, to locations ranging from Vermont to Charleston, an automobile trip through the Southwest to California, and four visits to Mexico. Wherever he traveled, however, Hopper sought and explored his chosen themes: the tensions between individuals (particularly men and women), the conflict between tradition and progress in both rural and urban settings, and the moods evoked by various times of day. 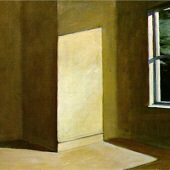 Hopper's work was showcased in several further retrospective exhibitions throughout his later career, particularly at the Whitney Museum of American Art in New York; in 1952, he was chosen to represent the United States at the Venice Biennale. Despite commercial success and the awards he received in the 1940s and 1950s, Hopper found himself losing critical favor as the school of Abstract Expressionism came to dominate the art world. Even during an era of national prosperity and cultural optimism, moreover, his art continued to suggest that the individual could still suffer a powerful sense of isolation in postwar America. He never lacked popular appeal, however, and by the time of his death in 1967, Hopper had been reclaimed as a major influence by a new generation of American realist artists.